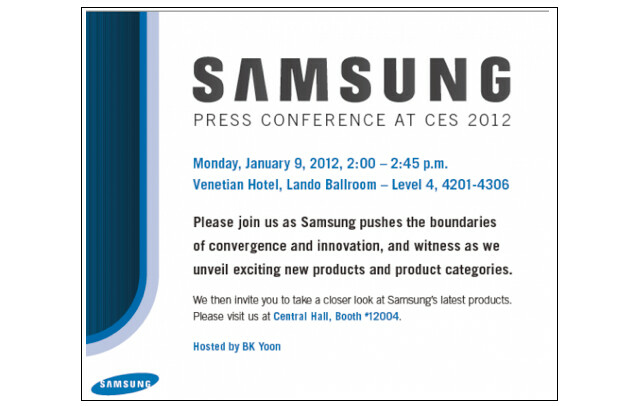 Samsung has sent out invitations announcing its media event for CES 2012, and is promising that the new products unveiled there will "push the boundaries on convergence and innovation". The press conference will be on January 9th from 2:00 to 2:45 PST, and will of course be hosted by Samsung's lovable president BK Yoon. 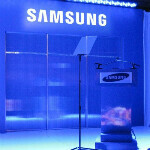 Samsung has been indirectly hyping up this announcement for a while now, as it has promised devices in the spring of 2012 that will "blow minds", and that the devices will be a "big step past the Galaxy Nexus class, in every way." So, it will be interesting to see what devices fall into that category. We're expecting to see more of the flexible displays that Samsung loves to bring out at every expo, and it's very likely that we'll get more info on the Galaxy S III, but both of those would likely fall into the "innovation" part. We're not too sure what to make of the "convergence" side of Samsung's promise, but it would seem reasonable that might be referring to the integrated Google TV sets that Samsung has been developing. It's unclear what else may be in the pipeline. The original Galaxy had a 3.2" display. The Galaxy S I had a 4.0" display. The Galaxy S II had a 4.3" display. Any surprise if the Galaxy S III has a 4.5" or 4.7" display. "that might be referring to the integrated Google TV" Just bought a samsung 55 inch screen. And it's awesome. But I know people will disagree with me, but I don't like google tv (espacially when it was released). But I also don't need it. Not needing it enough to purchase a separate box is one thing, but if it comes built-in to your TV, you'd probably at least find uses for it, especially with the new update that added apps and such. I know I'd like to have a good YouTube player on my TV, but that's about all I've considered using GTV for. A good YouTube player and Netflix with a better layout than my ps3 would be nice. Beyond that, I can't think of a single reason I'd want an internet ready tv. Yes, I do have a "smart" tv, but having a ps3, tablet, phone, and computer, there is no reason for me to have my tv connected to the internet. I saved a bit of money on my tv by not getting a 3D one, and I would have loved to have had the option to spend the same amount of money for a slightly larger tv without "smart" added to the title. So this explains were samsung galaxy rumors come from? rumor going around, is Intel powered device for Sprint. The Galaxy SII HD LTE is a minor step up from the Galaxy SII. Yeah it has a slightly faster processor and a better screen, but I don't think that would be something they would announce at this event. And I would think the Note would be announced by AT&T at their own event, not at this Samsung event. This Samsung event should be unveiling something not seen before. btw they have already released sgs II HD in corea. Where is Samsung Xcover waterproof, dust proof, shock proof, etc. any way I wanted to see some aluminum body phone, I am sick of cheap plastic phones. I would love to see Samsung incorporate some metal (preferably aluminum, or "duraluminum" like they use in their laptops) into their phones. Especially if they keep a similar design language as to the SGS2 and GNex and have the metal wrap around the edge of the phone and over the bump on the bottom, where the hard plastic is on the current phones. The dark handsets could have black plastic and gunmetal colored brushed aluminum to make them stand out from other phones, and the white ones could have white plastic (obviously) and light silver brushed aluminum to make them beautiful. they have the antennas in the hump so if the hump is metal you will get some serious antenna problem..wouldnt mind it around the sides etc..i would rather have a phone with good signal etc than have a phone that compromises to have a ''premium'' feel..people dont give samsung credit for using plastic,its probably the most durable material and best material for a mobile device and personally for me makes the s2 feel a lot smaller than it is because of the lightness. No SGS3. It'll be the Galaxy B&O(Bang&Olufsen). Samsung Galaxy Nexus S !!! As I said, 2012 is going to be fun as hell to be a consumer. I might end up being a kid in a candy store. Now that the low tech upgrade of the iphone 4s is out of the way and the wait for the galaxy nexus is out of the way, which I may add, I just got the galaxy nexus for vzw and my droid 2 held a stronger signal than the nexus go figure lol. Let the wait for the next big phone begin! I am strongly considering returning the nexus and waiting to see what new technology is in store for this year I can wait I'm pretty conditioned after waiting for the sg2 and the nexus all year lol. 2012 year seems to be its going to have devices far more advanced than 2011 year. dont think we will the gs3 at ces most likely at mwc where the galaxy s and s2 was announced so my best bet is the s3 will also be announced their..we will definitely see the gs3 within the next 3 months and thats not too long to see what is probably going to be for me the best phone of 2012 considering what an awesome and a hit their current gs2 devices are..cannot wait...on a side note the htc edge also looks awesome but i have never been a fan of there batteries..they aways seem to put a smaller battery in a thicker phone compared to samsung who manage to put a bigger battery in a thinner phone...makes no sense.